Carbon dioxide is a colorless, scentless and non conductive gas that can effect quickly and efficiently into the protected area. Its density is about 50% higher than . the air density. During extinguishing, it is seen as a white mist. It does not make residue on the materials or affect adversely the materials. Reduces the concentration of oxygen causes suppression to fire in the space and creates a cooling effect causedby rapid expansion of the gas. Even if the CO2 concentration is low in concentration, it should not be ignored and considered to be a danger to breathing. Also, the visibility during discharge is greatly reduced due to the formation of CO2 mist. 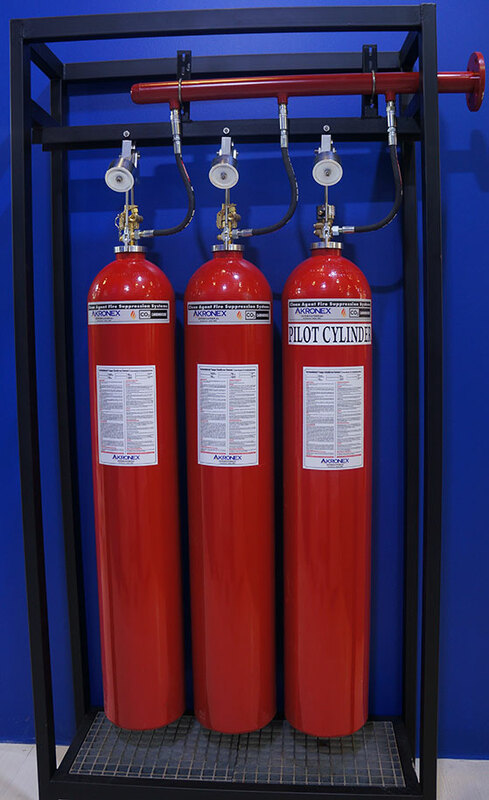 This fire suppression can be applied in areas such as transformer rooms where people are not always present when appropriate safety measures are provided. After completing the suppression system, the area must be adequately ventilated. Because the density of carbon dioxide gas is heavier than air, it accumulates at low. 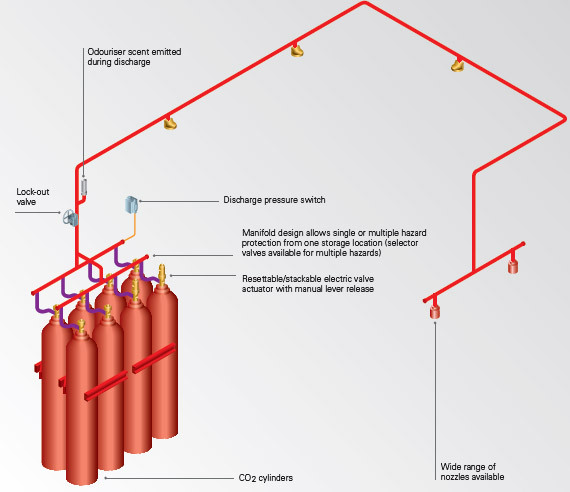 CO2 is stored in pressurized cylinders up to 60 bar at 21°C. The distribution system consists of a series of 67.5 liter cylinders, which are tested at 250 bar, charged using a filling factor of 0.75 Kg / L or 0.67 Kg / L, with maximum storage temperatures of 40 °C and 50 °C. The discharge time is 60 seconds, (30 seconds for local systems). The minimum discharge time calculated according to the standards should be 60 seconds. For local applications, the discharge time should be at least 30 seconds. If longer cooling time is required to complete the extinguishing process, the discharge time can be increased. If longer cooling time is required to complete the extinguishing process, the discharge time can be extended. 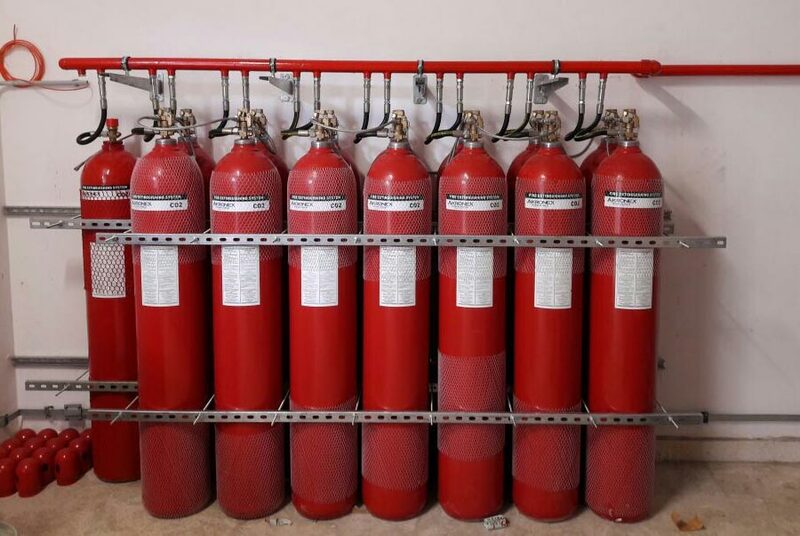 Several fire extinguishing applications where CO2 is suitable are listed below. Silos, archives, flammable liquid storage areas. 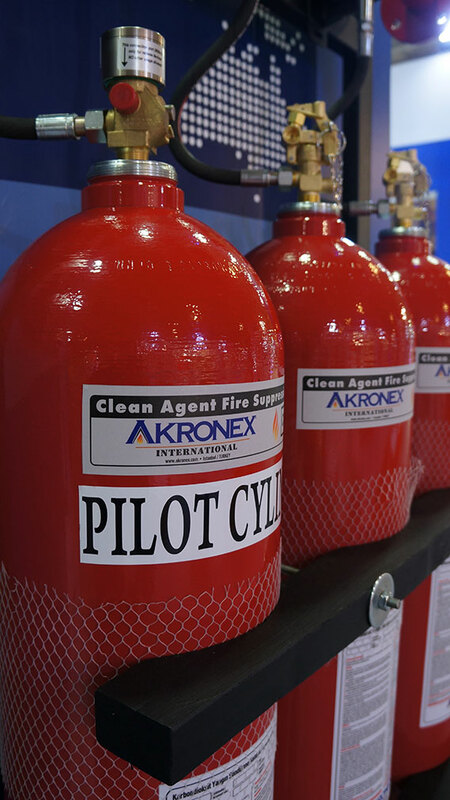 The cylinders of AKRONEX CO2 Fire Suppression System’s cylinders can be fixed and stored in the container according to the customer request. This solution provides ease of maintenance, transportation and installation. This creates a more secure environment. Gas leakage in the cylinders can be measured by weighing the cylinders and using special test devices. In order to continuously monitor the amount of gas in the cylinder in AKRONEX CO2 systems, the special design of AKRONEX Weighing System can be installed optionally. People who benefit more from nature and world blessings by the development of technology have also caused to occur pollution at the same time. Carbon dioxide fire protection systems are a responsible choice to protect nature.